of poems that can be read at your ceremony. Please contact us directly for further information. 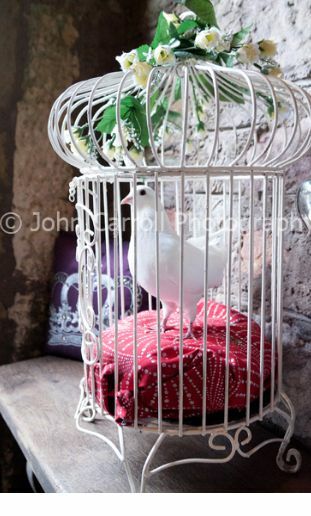 If weather conditions do not permit birds can still be displayed in an ornamental cage. These emotional feelings can be represented through the symbolic release of doves, A short inspirational reading can be done prior to the release at either the graveside or in the garden of remembrance. The dove represents the spirit of the departed loved one being released to begin the final journey home. Three doves are released to ascend and circle the area, moments later a single dove is released representing the spirit of the departed loved one. Once released it joins the others which represents the Farther, the son and the holy spirit and is lovingly guided on the final journey home. We are entirely flexible and are happy to adjust the above packages to suit your individual requirements. Throughout your occasion we will always be discreetly on hand to assist and to ensure the smooth running of your release. © 2013 White Heather Dove Release - All rights reserved.